Comet ISON is in solar probe's sights — and a storm is coming! Comet ISON popped into the very edge of the Solar and Heliospheric Observatory's field of view late Tuesday, and it looks as if it might be in for an early surprise: an encounter with a storm of electrically charged particles from the sun. The interaction with the outburst, known as a coronal mass ejection or CME, would take place a day before ISON makes its long-anticipated Thanksgiving Day swing around the sun. It's uncertain whether ISON will survive the next couple of days, but experts say a solar storm by itself shouldn't cause the comet's doom. 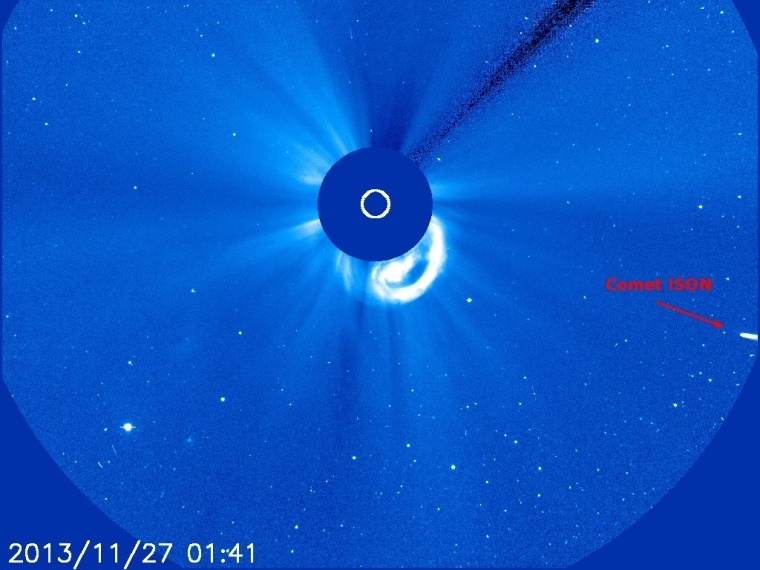 A coronal mass ejection would have "more of an effect on the tail," Karl Battams, an astrophysicist at the Naval Research Laboratory who's part of the team for the NASA Comet ISON Observing Campaign, told NBC News last week. On Tuesday, Battams said he was marveling over the interaction between ISON and the solar wind. If the CME vs. ISON clash shapes up the way it's looking, he'll have even more to marvel at. ISON's appearance in an ultraviolet image from the sun-observing SOHO satellite's LASCO C3 detector sparked comment during Tuesday's Reddit "Ask Me Anything" session with Battams and other planetary scientists studying ISON. A Reddit user pointed out the picture and said "I am concerned about the solar event that has just taken place and will be ISON directed." "WOW! That's ISON!! Seriously!!!" Battams said in his reply. "And a nice CME blasting out to greet it! If I had gold, I'd give it to you!" Check in with the SOHO website to see how the clash turns out. Will Comet ISON beat the odds? For updates on Comet ISON, keep tabs on Space.com, the Comet ISON Observing Campaign, Hubblesite's ISONBlog, SpaceWeather.com and the websites for Astronomy Magazine and Sky & Telescope. On Twitter, follow @ISONUpdates, @CometISONnews, @CometISON2013, @SungrazerComets and @Cosmos4u.